The definition of hydroponics — the growing of plants, using mineral nutrients, without soil — underscores the importance of nutrients within hydroponic systems. For example, the highly important element phosphorus may be present in soils, but it is held, or “fixed” to soil particles so tightly, that it is often not available for absorption by the plant’s root system. In the case of Nitrogen (N), if microbial colonies that are required to convert organic forms of nitrogen to plant available inorganic forms are absent or limited in size, the availability, type and concentration of this important element can be limited. In hydroponic systems, growers are able to control not only the type and concentration of nutrients but also their availability. Nutrients are applied directly to the plant root system. This results in significant energy savings since the plant does not have to use its energy to support photosynthesis and other reactions and processes required to build extensive root systems required by plants grown in soils. This energy savings often results in improved whole plant growth, development and yield compared to soil grown systems. Root systems of hydroponic plants are also routinely healthier and more efficient and root systems of plants grown in soils. Looking for technical information about our nutrients? Review our product labels and feeding charts. Many nutrient suppliers will point out that their formulations provide all the elements to satisfy plant needs as well as allow growers the ability to address nutrient deficiencies should they occur. 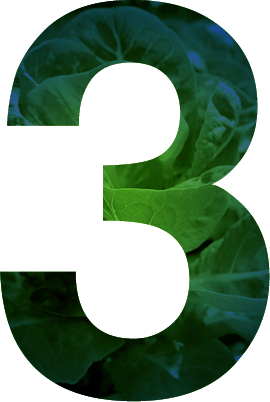 But modern hydroponic practices suggest that supplying all the elements using one-, two- or even three-part “convenience packages” may not meet the precise nutrient inputs required to ensure the plant is provided with the correct recipe of mineral building blocks during critical vegetative and flowering phases of crop production. Furthermore, it is often undesirable to chase nutrient deficiencies with formulations that contain too many elements. A grower may be correcting a specific nutrient deficiency while at the same time, putting the rootzone nutrient solution out of balance, creating nutrient “lockout” or wasting costly nutrient inputs. Under hydroponic production, once a plant begins to function as an autotroph, it must be provided light, water, proper temperature and nutrients to support growth and important plant functions such as stem elongation, photosynthesis and protein production. 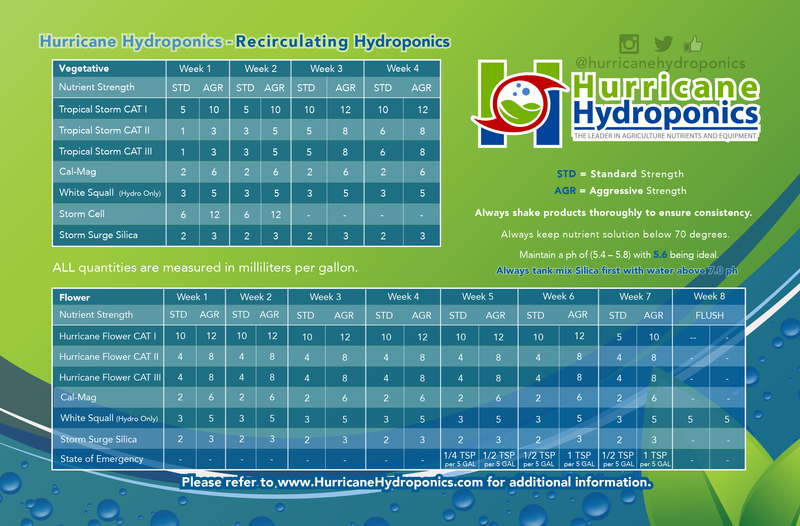 Hurricane Hydroponics has formulated a 1-part nutritional concentrate designed to supply a full spectrum of nutrients that will provide for a seamless transition from initiation of the autotrophic stage to the beginning of the vegetative growth stage. 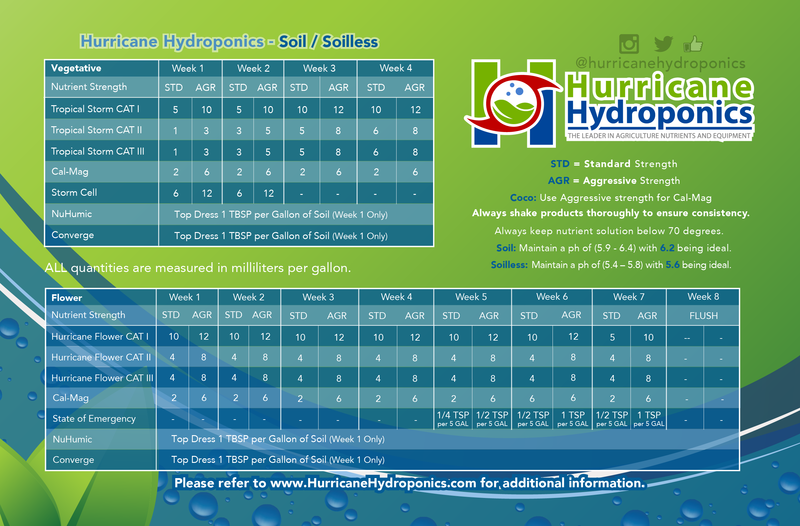 Recognizing the need for a flexible and comprehensive approach to hydroponic nutrient products, Hurricane Hydroponics has developed and formulated a three-part nutrient fertilizer concentrate system for the vegetative phase of crop development and a separate three-part nutrient fertilizer concentrate system for the flowering phase of crop development. 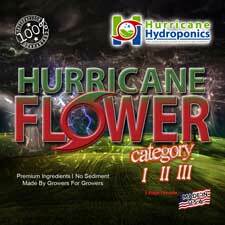 The Hurricane Hydroponic Comprehensive Nutrient Solution provides the grower with a full array of nutrient elements formulated for precise balance and optimal ranges for both the vegetative and flowering phases. Both the vegetative and flowering 3-part systems are fully customizable to enable growers the ability to fine tune their feeding program to achieve specific plant responses and offer leading edge exacting and accurate approaches to address nutrient deficiencies. 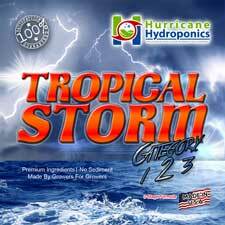 In addition, Hurricane Hydroponics has fortified each of its water soluble nutrient concentrates with the full complement of L-amino acids to enhance protein synthesis, increase nutrient efficiency and transport, improve metabolic function, promote energy efficiency and fortify plant defense mechanisms and processes. The flexibility of the Hurricane Hydroponics Comprehensive Nutrient System is ideal for those getting started in hydroponics as well growers with more experience who want nutrient concentrates that allow them to have the ultimate level of control. 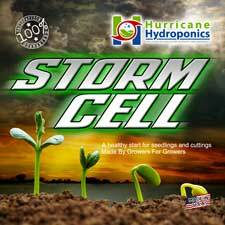 Ultimately we believe that the Hurricane Hydroponics Comprehensive Nutrient System will provide growers with precise nutrient feed programs that optimize desirable plant response parameters such as yield, quality and other commercial characteristics of horticultural crops.